You are here: Home / Featured Articles / Why Use Two If One Will Do? Why Use Two If One Will Do? The following reprint underscores early thought about pallet reuse, in essence the emergence of coordinating inbound receiving of pallets under load with their reuse for outbound shipment. “Why Use Two If One Will Do” was featured in The Palletizer, a material handling publication developed during the Second World War by the U.S. Navy Ordnance Materials Handling Laboratory in Hingham, Massachusetts. Its goal was to promote more efficient handling by the Armed Forces and their suppliers. 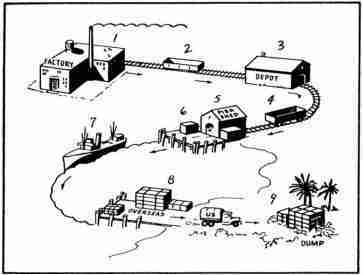 Even in the early 1940s, the benefits of supply chain standardization were starting to be more widely recognized, especially by those responsible for the daunting task of moving goods as expediently as possible from the States to the farthest reaches of the Pacific theatre of war. To this day, many companies still do not take advantage of the tactic of coordinating inbound and outbound pallet selection. About the time of the last war industrial skids of all sizes and descriptions began to come into common use in plants throughout the country. Most of these skids were built to fit the product they were to carry. Loaded skids were transferred about the plant with platform lift trucks, but when the time came to ship the material the skids were unloaded in box cars and taken back into the plant for further use. The development of the fork truck and pallet produced a more versatile system. Pallets can be more easily tiered than skids because the bottom facing distributes weight over the surface of the supporting load rather than concentrating it as do the legs or runners of skids. Being shallower, they take up less space. Consequently they adapted themselves to rail shipment better than skids. 1) if they did not they might never recover their pallets. 2) they had no assurance that their consignees even if equipped with lift trucks could handle their particular size and shape of pallet without more trouble than it would be worth. When the war came, the armed services faced a bigger problem of materials handling than had ever existed previously. The Bureau of Ordnance set up the Materials Handling Laboratory to engineer the job of handling as much of its material as possible on pallets. With the many links in the handling chain (see sketch) thus joined together under the supervision of one organization the two industrial objections to shipping on pallets were removed. Pallets would not be lost but merely exchanged between naval installations those sent overseas being chalked off as expendable. With all handling under one management, the second objection to palletized shipping (one plant’s equipment having trouble with another plant’s pallets) could be met by standardization of the pallets and equipment. The Laboratory realized that to have several sizes of each type of equipment at every Naval installation or to require constant adjustments would be confusing. Every size of pallet would require another size of safety sling. Fork trucks, and hand lift pallet trucks would have to be adjusted to each size. Uniform methods of carloading lighter loading and warehousing would be impossible. In short standardization was necessary to enable every link in the handling chain to know just what it was receiving and be prepared to receive it. The irregular and delicate nature of many ordnance items demanded special care in the development of unit loads. Drawing up and testing specifications for all these items would have been immensely complicated by having to deal with a motley collection of pallets of different shapes and sizes. Finally standardization avoids the situation of having plenty of pallets on hand but none of the right size. Just as the boarding house which serves the same meal to all comers can operate more efficiently and with less loss of food than the restaurant that offers a wide choice so a pallet pool can function more easily when all pallets are uniform. Having determined to standardize the Laboratory opted the 48” x 48” pallet which has several advantages especially for ordnance items. More important feature of this size pallet is that it fits standard 8’ 6” and 9’ 2” box cars beautifully. The figure 48 is a highly commensurable one – many standard box sizes will fit onto this pallet. Also these standard pallets are good for ammunition because a load of the proper weight (4000 lbs. for domestic shipment 2500 lbs. for overseas) usually comes to a convenient height. Finally, a square shape simplifies carloading and shiploading as well as warehouse stowage. Standardization of pallets is by no means a settled issue. The case was stated by one manufacturer that were he buying linoleum or pallet, he would measure his warehouse floor to see what size he required. Others measure the size of their goods. Either of these approaches is fine for intra-plant handling, but if chain shipping of pallets is to develop a sort of common denominator (or a few of them) that comes as close as possible to meeting everyone’s needs will be required. The Laboratory has approached the matter by making an effort to fit material to standard pallets, even to the extent of re-designing certain packages. Practice has shown that a minor portion of the palletizable items to be handled do not fit efficiently on the 48” x 48” pallet. The danger in employing a lot of different sizes, the same confusion that limited the use of skids after the last war. All branches of the armed services are now working towards pallet standardization. At a meeting of the Army-Navy Liaison Board, the Army decided to adopt the 48” x 48” size in use by the Navy to replace many of the odd sizes they have bee using. The Army Quartermaster Corps still uses a great many 32” x 40” pallets. The Bureau of Supplies and Accounts uses a 42” x 68” size in addition to the 48” x 48” to take care of large items. Judicious standardization of such things as nuts and bolts, machine tools, and electrical appliances has made possible modern mass production. In the case of the pallet the most sensible course would seem to be standardization on a few well – chosen sizes (including the 48” x 48”) which could handle most palletizable items for chain shipment. Some package standardization and simplification could be initiated by this development with resultant further increase in efficiency. The progress made by the Navy in shipping and handling unit loads should be of real value to industry. In contemporary usage, a skid is a pallet that does not have bottom deck boards. In actual practice, we see many “pallets” that do not have bottom decks in the alternative material category, typically those with legs or posts which can be nested. The original usage, as I understand, had to do with the practice of the pallet being used as a sled in the Pacific theatre of war during WW2. The pallet was pulled or skidded across the beach so as to minimize the exposure of troops to enemy fire.